Work takes my father often to the middle east. Each time, he comes back with wonderful stories of the gorgeous locales, exotic cuisine and nice people. He also often fondly remembers the unforgettable traditional “mezze” spread on the outskirts of Beirut, hosted by his friend Ben. Having met his friend from Lebanon when he came visiting to India and after having heard from him in detail about the food, culture and tradition of Lebanon I long to visit this marvelous place. According to the author of “From the tables of Lebanon”, “Lebanese cuisine is predominantly based on vegetarian dishes, although lamb, fish and chicken are also used”. The author goes on to say that this cuisine is great for vegans and vegetarians to explore since it uses fresh vegetables, fruits, nuts and olive oil in abundance. According to Susan Ward, author of "Lebanese Cooking", although many of the same dishes are found in neighbouring Syria and Jordan and with slight variation in Eqypt and Turkey, much of what the world knows of as middle eastern cuisine is Lebanese. Semolina syrup cake is called Basbousa in Egypt and Namoura in Lebanon. The picture of Basbousa in “Quick Vegetarian Dishes” , had often caught my attention, but somehow I had never gotten around to making it. When the ever charming Meeta announced “Taste Lebanon” hosted by lovely Beth, I immediately wanted to be a part of it and wanted to create something elaborate using exotic Lebanese ingredients. But life came in the way and I soon got sucked into one thing after another until a reminder came in the form of Meeta’s tweet on twitter right when I was in the middle of festival preparations, cooking elaborate festival meals and time was sparse. My mind raced back to the picture of basbousa which Beth confirmed to me was namoura in Lebanese. This cake is not just easy to make but is quick to put together too. I especially love cooking with semolina. As an afterthought, reminiscent of honey cakes while grwoing up, I quickly stirred some honey into the sugar syrup. 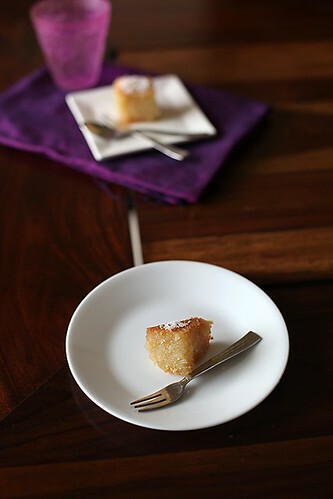 The cake baked to a lovely golden brown with a very delicate, heady aroma arising from the magic of semolina and coconut. What’s not to love when you have something exotic and delicious with minimum amount of time spent? Thank you lovely ladies for making me discover a small part of lebanon through this wonderful sweet creation that is bound to be a part of my favoured list of recipes. Preheat the oven to 175 degree centigrade/ 345 degrees F.
In a large bowl mix all the dry ingredients, the semolina, coconut, sugar and soda together. Mix in the melted butter and milk and stir until well combined. Put in this mixture into a buttered, shallow medium sized oven proof dish and level the surface with a spatula or a palette knife. Bake for 30 minutes or until golden brown on the top. In a medium sized sauce pan, place the sugar and water on low heat and stir until the sugar dissolves completely. Increase the heat to medium and then bring the mixture to a vigorous boil and cook until it coats the back of a spoon or reduces by about one-third or until it reaches 108 degree centigrade/ 220 degree F on a cooking thermometer. Stir in the lime juice and allow to col. Once cooled or warm, mix in the honey and stir well. Allow the cake to cool sllightly, for about 10 minutes and then cut it into squares or diamonds. Carefully pour the syrup over the cake. It will look like a lot of syrup, but the cake will absorb all the syrup gradually. This might take a couple of hours. 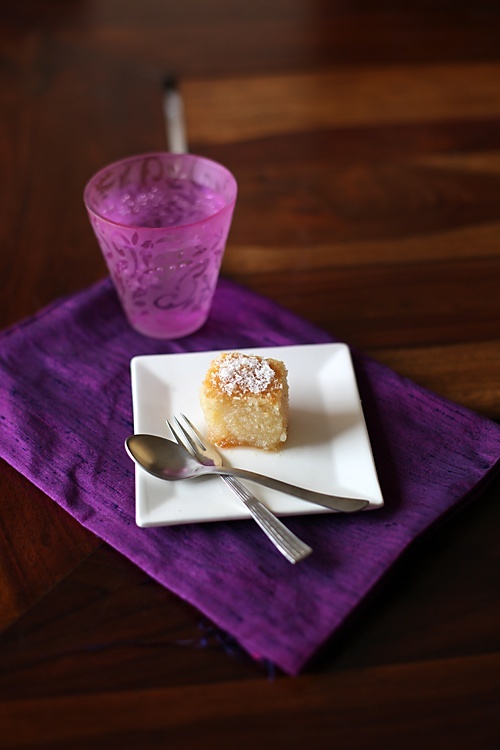 You can dress up the cake by sprinkling some dessicated coconut or blanched almonds. This cake tastes best when the syrup is gradually allowed to soak in, so dont rush this step, infact its best left to soak overnight. Adapted from "Quick Vegetarian Dishes"
This is beautiful. I love the deep shade of purple you used in the photo. The cake itself looks incredible moist and scrumptious. Oh this looks wonderful and perfectly moist. Anushruti thank you so much for taking time to join us at the Monthly Mingle. Hugs! The cake looks beautiful 🙂 And your pictures are very colorful and lively. Just a quick query, is it necessary that the syrup is poured after the cake is cut or can I just pour the syrup, allow the cake to soak it up and then cut into pieces? Ashwini: Thanks. It is very important to cut the cake before you pour the syrup or else once the cake soaks up the syrup, it will be difficult for you to get uniform well cut pieces. Hi Anushruti, Thanks for the reply. I shall follow your instructions and try this out. lovely sharp click where I can almost see the crumb effect. YUM! Looks delish and the lemon and honey combination sounds divine. I think I will have to give this a go! Love your site too Anushruti and will be checking in again soon! love ur site a lot. I tried many of ur recipes n all were a hit. Can u plz upload the recipe for Bisibelebath (BBB powder as well) n also some recipes for side dishes for rotis n rice as well. I'm so happy all of you are enjoying this. Sridevi: Thanks for your feedback. Will try and post bisibele bhath recipe sometime since there have been a lot of requests for it. Hi Plz can u advise if we can use fresh grated coconut instead of desicated coconut. I seem to have plenty of fresh coconut with me………. Manya: For this recipe its important to use dessicated coconut as fresh coconut tends to add more moisture and you wont be able to get the perfect texture. There are many other recipes here with fresh coconut. Do take a look. For instance Coconut Burfi and Cauliflower Curry. 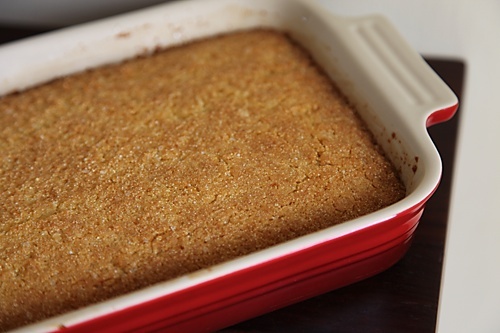 basbousa is one of my family's favorite dessert since the day i made it. try it with coarse suji and it tastes different but good! Cake looks soo easy and delicious…Love all your picture.I tried your Vegetable Briyani.We all loved it!! Yay! This sounds like the wonderful cake my cousin's Arabic grandma used to make that I have been trying to get the recipe for for years. I am so excited to try this out! Intriguing and ever so delicious. I often look at semolina and wonder what to make with it. This seems just perfect! Your pictures are beautiful A! I was introdueced to this cake by a friend many years ago and is something we really like. Your picture of it dressed in regal purple is pretty. First time here, I was directed to your blog through taste lebanon post on DKS… and I am happy i found it! Your namoura looks excellent. It's one of my favorite dessert! Such a simple and interesting recipe, I am glad I found your blog through this event. I want to make this cake tomorrow and wanted to know if desiccated coconut is something I buy off the shelf or just grated coconut. Honestly wasnt aware there was a difference. S: Yes, you can buy dessicated coconut in the market. Dessicated coconut is dried and different in flavour and texture from fresh coconut. Sidra: Orange juice in this sounds quite good. Thank you for your feedback. question: is it necessary to cut before soaking? how about we poke some holes and pour the syrup over the cooled cake in the tin itself? thoughts? Nags: It is important to cut the cake before soaking if you want to get neat slices. Once the cake soaks up the syrup, its difficult to cut into proper slices. Once cut, the syrup is poured into the tin itself. As a Lebanese, I am very touched by your kind and exact words about our country and cuisine. Unfortunately, not a lot of people know this small but very diverse and interesting country! Looks wonderful. I am planning this cake for the new year party potluck. After cutting the cake into pieces and soaking overnight, should the pieces be transferred to a different serving tray. Are the pieces easy to lift and transfer as it looks very soft. I have never made this and making sure I don't make mess. You could transfer it into a different serving tray to make it look more elegant. The pieces are easy to lift if you cut them properly. All the best. Came here from 'Monthly Mingle'. Gorgeous cake. One quick question. Can I use a square muffin pan and then pour the sauce into each hole once the cake is done. I plan to make this today or may be tomorrow. The entire recipe sounds SOOO temptingly delicious !! Also can I use coconut powder in the place of dessicated coconut ? Made the cake today and it came really well. The little squares were so cute. all due to BRidget Hennessy's kitchen … thank you GIRL! Mala: You could try using coconut powder instead of dessicated coconut. It is essentially the same! Shai: Glad you like this recipe but it is not exactly like Kurma Dasa's recipe. For instance his recipe doesnt have the baking soda in the cake or the honey in the syrup. But it is definitely adapted from his recipe and that's why it is also mentioned (credited) in the recipe. I made this cake today, it tasted great! The only problem was that it could not be cut into proper pieces, the pieces just disintegrated and eventually into crumbs! I do not know where I went wrong but I did bake the cake for well over 35 mins till it turned golden brown. Any suggestions? Bella: Are you sure you measured the ingredients properly? One of the reasons could be that you used excess liquids that's why it didnt hold its shape. This is a wonderful recipe – made it for my husband this week and he loved it! The coconut lends a delicious aroma and your directions were straightforward and easy to follow. Only thing I changed was I used cane sugar for the cake part instead of regular white sugar – it enhanced the lovely golden colour. This looks so delicious……planning to make it for Diwali party……. Is it possible for u to give the measurements in cups……. Stumbled upon your blog on accident and I must say a very happy accident it turned out to be! LOVE your blog. Very inspiring! One question about the recipe. I always get confused with the word semolina. I know that upma rava is coarse semolina and idli rava is fine semolina…your recipe says to use fine semolina….so I should use idli rava? Please HELP! Pavani: Welcome to divientaste and I'm glad you like it here. 🙂 Fine semolina is wheat semolina what is called as bombay rava in India. You can't use idli rava here as it is made of rice. 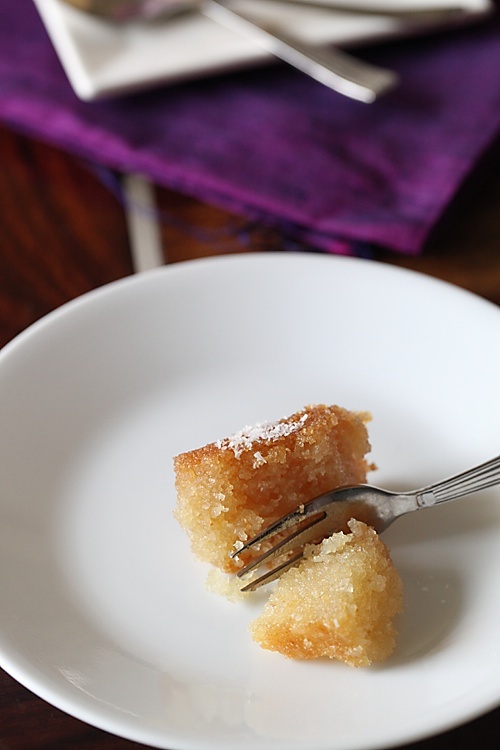 You need to use fine wheat semolina. However idli rava can also be substituted and will make for an interesting variation. Valentina: How nice to know that you recreated the magic you experienced with this recipe! It is a delectable dessert! Matthew: I used a 10" by 7" rectangular pan. I have specificcaly not metioned the size of the pan here unlike my other cake recipes because you can actually use any medium sized pan here and it would work just as well! wow!!!! by the end of this page my mouth is literally watering….i'm sooo gonna try this!!! thank YOU!! Hi, when letting the cake soak overnight, will it not spoil? Tristan: Good question. I personally don't allow it to soak overnight as I live in a very humid environment. But, I guess if you live in drier climates, it should be okay. Meeenal: I'm sorry I'm a bit late in replying. How sweet a sweet tastes is so subjective but I would like to call this perfectly sweet. Altering the sugar in the sugar syrup can affect the texture of the cake so I would suggest that you make this as it is and if you want to reduce the sweet then use a little less sugar in the cake. You can make this ahead! It will be perfect! Nour: I'm sorry I couldnt reply earleir as I was travelling. Baking soda is an important ingredient in this cake and I'm not aware of any other substitute for it at this point in time. Anushruti! Quick question: I have no access to dessicated coconut, and I see in the comments you have already said one cannot go with fresh coconut. Is there some way I can dry it by roasting it myself? Also, semolina is regular rava right? This cake sounds so good. I tried making the syrup and as soon as i add the lime juice into the sugar syrup, the syrup thickens as soon as i add the lime juice and crystallizes. Any idea where i am going wrong? btw.. i am a huge fan of ur recipes and ur photography! Hi there, is the dessicated cocunut sweetened or unsweetened? Thanks in advance fr your reply? Hi there, Is the dessicated coconut sweetened or unsweetened? I am yet to try this recipe. I have some queries regarding the taste. .Is the sugar syrup sour because of lemon/lime juice? If so, does the sourness also seep in to basbousa when we pour the syrup over it? Would be grateful if you could reply.Thank you in advance. Have tried your tomato coconut milk recipe. Loved it! Your Marblecake recipe.The most moist and soft cake that I have made so far! Saffron nutmeg cookies. Heavenly! I admire your writing style and the meticulousness with which you record the recipes. Thank you for the soul uplifting recipes. Look forward to try out more of your recipes. nageshwari- Thank you for your inputs. No the sugar syrup is not sour at all, so dont worry on that front. Greatly appreciate your inputs w.r.t my recipes. Hope to hear from you again. Thank you very much Anushruti for clearing my doubts .This recipe is on my "to bake" list. Will report my results! I'm from Lebanon & I enjoyed reading this article. Your Nammoura looks great! We'll be happy to have you in Beirut. Rita: Hello! Thanks you for writing. I'm really happy to hear from you! Would love to visit Lebanon someday! I hear its a beautiful place. Hope that happens. Waiting to try it out next week….. This takes me back. We moved to Oman when I was 11 and I had to take Arabic lessons to catch up. Since it was the month of Ramadan my instructor, who was Egyptian, often gave me a little treat for the end of class each day. Her kunafeh – a vermicelli cake not unlike basbousa – lingers (in spirit) in the back of my tongue to this day. Thank you for this beautiful post. After looking around for basbousa recipes for a while, I tried this one and it turned out to be absolutely delicious!!! It is so moist, sweet and heavenly 🙂 The only change I made to the recipe was adding a few strands of saffron to the syrup which gave it a very beautiful colour and flavour. Thanks for the amazing recipe. Its very simple, clear and easy to follow. The cake turned out delicious and had a very nice texture. 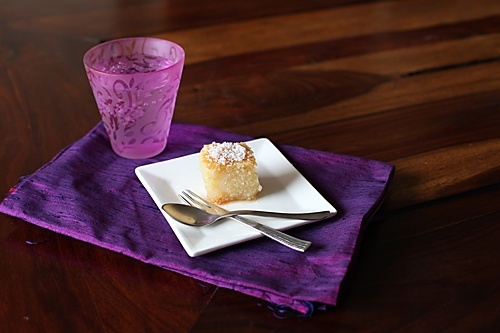 The lemon and honey combination imparts a delicate flavour to the cake. I would encourage all readers reading this comment to try the recipe, its a sure hit. Shweta: I'm so happy to know that this recipe turned out well for you! Mayur: Thank you for the feedback! Hi Anushruti.. what would be the sugar syrup consistency in terms of thread..? Havent checked the thread consistency but you can aim for a sticky consistency like gulab jamun syrup.